Before :- K.C. Gupta, J. For the Petitioners :- Mr. H.N.S. Gill, Senior Advocate with Mr. Hari Chand Rahi, Advocate. For the Respondent :- Mr. Sidharth Sarup, AAG, Haryana. K.C. Gupta, J. 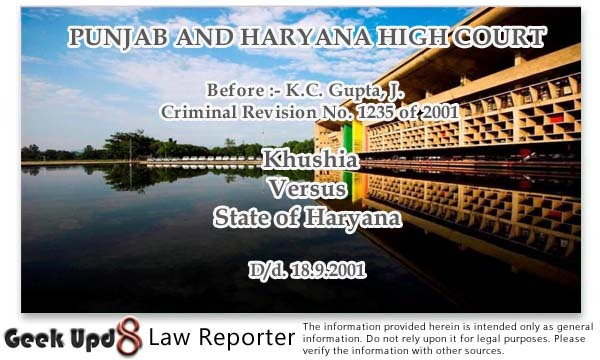 - This revision is directed by Khushia and Jamshed, accused, against the judgment dated 10.3.2001 passed by the Additional Sessions Judge, Gurgaon, whereby their appeal was dismissed and judgment dated 6.4.2000 and order dated 7.4.2000 passed by Sub Divisional Judicial Magistrate, Nuh, vide which the petitioners were found guilty under Section 8 of the Cows Slaughter Act and were sentenced to 18 months R.I. were up-held. 2. Briefly stated, the facts are that on 5.3.1994, Lal Singh, ASI alongwith other police officials was present in Government vehicle bearing registration No. HYG-4123 in connection with the investigation of case No. 6094 under Sections 138, 148, 323 IPC at Addbar Chowk, Nuh, Head Constable Raj Singh was the driver of the said vehicle. He received secret information that the petitioners alongwith their co-accused Sujat (now proclaimed offender) were slaughtering three cows in the 'Dehar' of village Hussainpur in the south of Hussainpur-Hodal road and if raided could be apprehended red-handed. Accordingly, they went to the spot and found that Sujat and Khushia were removing the skin of the cow with the help of knives and Jamshed was making pieces of beef with an axe. The police party tried to overpower them but they succeeded in running from the spot. One axe, two knives, three ropes, 3 cows skins and about 5 kgs. of beef of each slaughtered cow were recovered from the spot. The same were taken into possession vide memo. Ruqa was sent through Constable Dharamvir, on the basis of which formal FIR was recorded. The site plan of the place of recovery was prepared. Statements of the witnesses were recorded. After the completion of the investigation, the police presented the challan under Section 173 Cr.P.C. 3. The presence of Sujat accused could not be procured and as such, he was declared proclaimed offender vide order dated 25.11.1999. 4. The petitioners were charged under Section 8 of the Punjab Prohibition of Cows Slaughter Act, 1955, for contravention of Section 3, to which they pleaded not guilty and claimed trial. 5. After conclusion of trial, the learned Magistrate found them guilty and convinced vide judgment dated 6.4.2001 and vide order dated 7.4.2001 as stated above. 6. Aggrieved by the said judgment and order, the petitioners filed an appeal which was dismissed by the Additional Sessions Judge, Gurgaon, vide his judgment dated 10.8.2001. 7. I have heard Sh. H.N.S. Gill, Senior Advocate alongwith Sh. H.C. Rahi, counsel for the petitioner, Sh. Sidharth Sarup, AGG, Haryana and carefully gone through the file. 8. Counsel for the petitioners contended that the police raided the place on receipt of secret information but no independent witness was joined in the raiding party and this suggested that the prosecution case was not free from doubt. In my opinion, the contention of the learned Counsel is not tenable. It is in evidence of PW3, Lal Singh, Sub-Inspector, that after receipt of secret information, he had made efforts to join independent witness in the raiding party but none was prepared to join. If he had delayed the raid in the hope that the independent witness would be available, then he could not have seen the petitioners slaughtering the cows and by that time they would have escaped. He further contended that the petitioners were not apprehended at the spot and on the other hand, it is alleged that they had run away and as such, their identification in the Court was no identification and in fact their identification parade should have been arranged and in the absence of identification parade, it should be presumed that the identification of the petitioners was not established. Again, in my opinion, the contention of learned Counsel is not tenable. The Investigating Officer alongwith other police officials, when reached the spot had seen that Sujat, proclaimed offender and Khushia, petitioner, were removing the skin of the cow with knives which they were holding and Jamshed, petitioner, was found making pieces of the beef with axe. The police party had tried to over-power them but they were successful in running leaving the axe, two knives, three ropes, 3 cow skin sand 5 kgs. of beef of each slaughtered cow at the spot. Therefore, it cannot be said that they had identified the petitioners only in the Court but they were identified at the spot and their names were mentioned in the First Information Report. 9. Counsel for the petitioners next contended that there were certain discrepancies inasmuch as PW4, Raj Singh, Head Constable had stated that quantity of beef was 5 kgs. but the other witness had stated that it was 15 kgs. PW4 has admitted his signature on the recovery memo in which it was stated that the quantity of the beef recovered was 15 kgs. i.e. 5 kgs. of each cow. 10. Counsel for the petitioners also contended that the petitioners had been falsely implicated at the instance of one Yunus, Lambardar, who was friendly with the Investigating Officer and in order to prove this fact they had examined DW1-Subrati. The version of the petitioners cannot be believed because the Investigating Officer had not been cross-examined at all on this point that since he was friendly with Yunus, Lambardar, so the petitioners were falsely implicated at his instance. If the question had been put to him, he would have been able to explain whether he had any relationship with Yunus or not and further whether he has falsely implicated the petitioners at the instance of Yunus. 11. No other point has been urged before me. Thus, there is no illegality or perversity in the judgment dated 6.4.2001 and order dated 7.4.2001 of the Sub Divisional Magistrate, Nuh and judgment of Additional Sessions Judge, Gurgaon, dated 10.8.2001. However, the petitioners have been dealt with harshly to some extent so far as the sentence is concerned. I think it will meet the ends of justice if the sentence is reduced to nine months R.I. each instead of 18 months R.I. each. Ordered accordingly. With this modification in the sentence, the revision petition is dismissed.